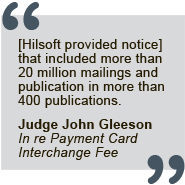 Hilsoft Notifications has built a collaborative team of some of the industry’s most talented legal noticing professionals. Over the years, our team has successfully implemented notice programs involving thousands of media placements and millions of mail pieces in both national and international markets. 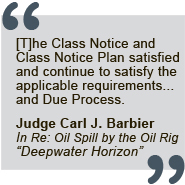 We work seamlessly with various media production companies, claims administration firms, and Special Masters to ensure the best notice implementation possible for each and every case. Kyle Bingham is Hilsoft’s Manager of Strategic Communications, involved in all aspects of researching, planning, and executing legal notice programs. He has more than thirteen years of advertising experience. Stephanie Fiereck is responsible for drafting detailed legal noticing documents for publication campaigns and court submission. She is an active member of the Oregon State Bar. Kate Komraus is responsible for media planning along with negotiating, buying and placing print and online media for Hilsoft’s legal noticing campaigns. Tammy Ollivier is responsible for managing implementation of legal notice ad campaigns for class action, bankruptcy and securities cases. Maggie Ivey has designed and implemented many high profile legal notice programs for class actions and regulatory matters, including consumer fraud, antitrust, telecommunications, securities, banking, insurance and bankruptcies. 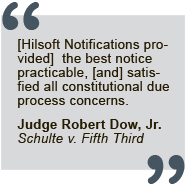 Lauran Schultz consults with clients on complex legal notice programs developed by Hilsoft Notifications. He has more than 20 years of experience.